I’m ashamed to say this is only the second book by John Green that I’ve read (I was supposed to read Papertowns after I saw the film that came out last year but forgot…. oops). Looking for Alaska is truly a masterpiece and a definite must read. A coming-of-age novel that introduces young readers to the devastation of the loss of a close friend / loved one, and the trials they go through in order to get over the overwhelming feeling of loss. Miles Halter is a very peculiar young man. His strange hobby of memorizing infamous last words makes him a bit of an outcast. He doesn’t fit in at his old school and so decides to transfer to a more prestigious high school Culver Creek Boarding School – the one his father went to when he was younger. Moving to a new school means a brand new start and a clean slate and Miles is determined to find there what he couldn’t in his old school. Friends. Belonging. Adventure. And the Great Perhaps. It doesn’t take long for him to befriend his roommate, the Colonel and his friends, including the mysterious Alaska. She’s so different, so interesting and Miles can’t help but be attracted to her. Together the are invincible, together they pull pranks and rule the school and it is only together that they can survive high school and the many emotional trials they may face. Maybe I had some expectations of this novel, but that’s only because I thought The Fault in Our Stars was truly brilliant. It’s no wonder Green is quite infamous in the YA genre. It’s like he could HONESTLY portray the experience and the feelings teens have in high school; their fears, their worries, their anxieties, while also encouraging them to have fun and enjoy their youth. I don’t think I ever understood the phrase, “These are the best years of your life” until now. When you’re at that age (in high school) you truly feel invincible. And perhaps you won’t recognize the feeling while you’re there, but as an adult, looking back I really did feel like I could do anything. 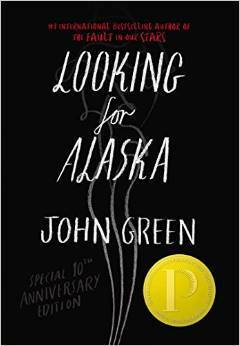 I will definitely say that Looking for Alaska would definitely have to be one of my favourite YA novels. The story is truly engaging and captivating and is the kind of book you really don’t want to put down. It is the kind of story you read and think, “I wish I had done more with my high school career”, well at least that’s how I felt. Aside from the very realistic formation of the average teenage group dynamic there are also a lot of more mature aspects that Green touches on. He doesn’t make the characters look stupid and gives them a lot of credit. What I mean is that he makes them intelligent. For example they touch on religion, living life to your fullest, but about suffering, and what suffering means to an individual, a group, a religion, and how we get through life dealing through that suffering. Like in The Fault in Our Stars, this novel had me reading the last chapter over and over, analyzing, learning and coming to terms with what lesson Green is trying to teach the reader. Young Adult or just Adult, this book is highly recommended for those looking for something…inspiring and at the same time eye-opening.